As one of the most diverse ecosystems on the planet, coral reefs are an important part of our world. Developer Tinybop attempts to showcase this importance through their latest app: Coral Reef. 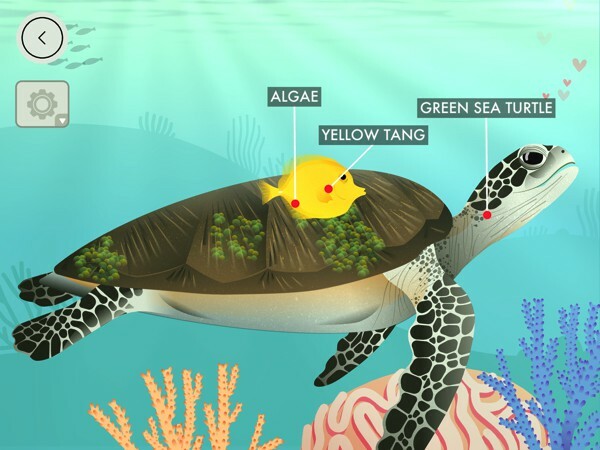 Coral Reef by Tinybop is the tenth app in Tinybop's Explorer's Library, a series of apps designed to promote scientific curiosity. In each app, kids learn fascinating topics—such as the inner workings of the human body, how the weather works, or different kinds of homes from around the globe—as they explore interactive models. Coral Reef, as you might have guessed from the title, takes kids to a beautiful underwater world to discover how sea creatures live together and interact with each other in an ecosystem. 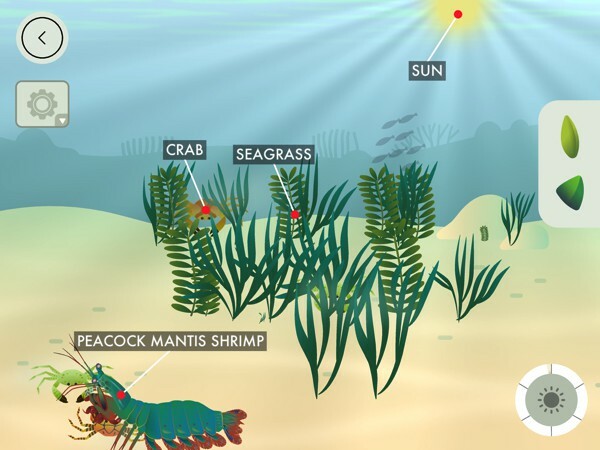 When kids open the app, they will see several sea creatures appearing around a coral reef: Cleaner Fish, Seagrass, Parrotfish, Blacktip Reef Shark, Box Jellyfish, Peacock Mantis Shrimp, and Linckia Sea Star. They can then tap each creature to play with them while learning more about a specific topic. For example, in the Cleaner Fish section, they learn that some creatures serve as a "cleaner" for bigger creatures by eating parasitic algae off the latter's body parts. Other activities kids can do include growing seagrass to provide food and shelter for other sea creatures, help a parrotfish keep the coral reef healthy, and feed and watch a box jellyfish digest its food. Kids can also observe how sea stars clean up scraps of dead creatures on the sea floor, feed a peacock mantis shrimp, and start a shark feeding frenzy. If desired, it's possible to turn on labels from the Settings panel on the sidebar. These labels lets kids learn the name of each creature on screen. Parents or teachers can download a free handbook packed with facts and discussion ideas to extend the learning process. In Coral Reef by Tinybop, there are no rules, scores, or time limit. Kids can explore as much as they want and at their own pace. The app has labels in 20+ languages to teach vocabulary, however it can still be used even when they are turned off. The app is safe for kids. It doesn't in-app purchases and third-party ads, and doesn't require an internet connection to use. 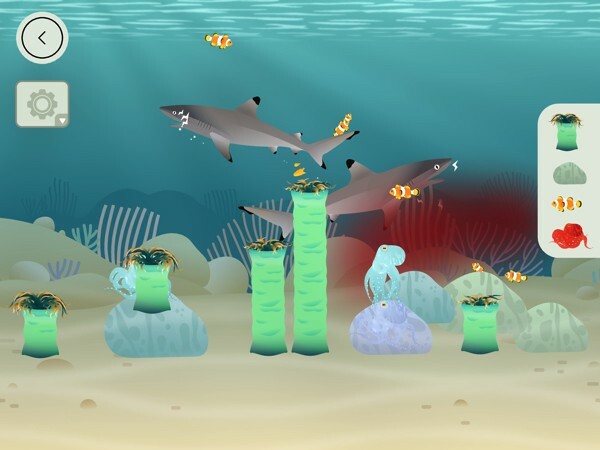 Coral Reef by Tinybop is a great way to introduce kids to the coral reef ecosystem. Even though the app doesn't have much text or explanation, it's successful in piquing one's curiosity about life underwater through beautiful illustrations and fun interactions. Kids will love discovering the little sparks of life that appear after planting some seagrass, cleaning up a shark's teeth, or just watching the streaks of sunlight from the coral reef. One thing to keep in mind is the app's fairly realistic depiction of various natural processes. The Linckia Sea Star section, for example, shows how sea stars and bacteria decompose a shark carcass. Though it's not too gory, it might upset younger kids. As such, I would recommend the app for ages seven and up. I highly recommend Coral Reef by Tinybop if you're looking for an app to introduce your kids to life underwater. Beautifully illustrated and fairly realistic, it's a great way for them to explore various biological themes such as the food chain, symbiotic relationships, and even photosynthesis. And while there isn't much text in the app, parents or teachers can use the free handbook to supply their kids with more in-depth information and hopefully, get them interested in learning more about the coral reef. Tinybop, Inc. is a Brooklyn-based studio of designers, engineers, and artists who make toys for tomorrow. If your kids love imagining new creatures, The Creature Garden is the app for them. It's beautifully designed and packed with exciting details that encourage kids to explore, create, and play. It's also a great app to secretly introduce them to biology and physics. Highly recommended for kids and adults alike. Mammals is a beautiful app that lets kids discover the world of incredible animals. Kids will love playing with interactive models and learning about the anatomy of various animals. A must-have for budding scientists.